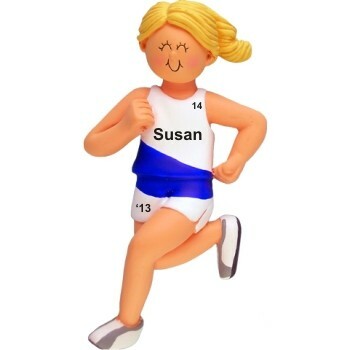 The athletically styled blonde female track and cross country personalized Christmas ornament is a fun way to recognize her efforts and achievements on the track, course or road. These sports ornaments personalized with the details you provide are available in other male and female "looks," so coaches often get one for each team member to build unity or celebrate success. The included ribbon offers easy display of the cross country / jogging female blonde personalized Christmas ornament that ships in our plush and pretty velvet bag.